2Face Idibia donates N3.5million to IDPs. 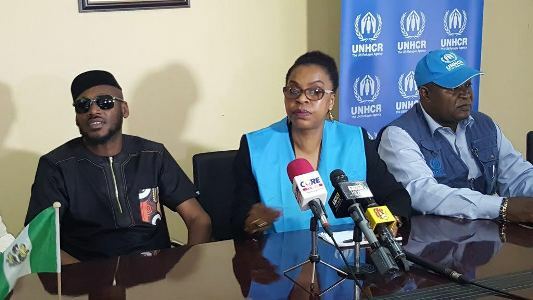 Innocent Idibia, popularly known as 2Face, on Monday, February 27th, presented a cheque of N3.5million to the United Nations High Commissioner for Refugees (UNHCR) in Lagos... Speaking at the presentation, the musician said that he was particularly touched when he visited camps of the Internally Displaced Persons(IDPs) in the North-East. "The conditions I met the internally displaced persons, when I visited their various camps were terrible. They were really terrible. The 2Face Foundation has, therefore, decided to enter into partnership with the UNHCR to see how we can help put smiles on the faces of these persons. My foundation is today presenting this cheque to the UNHCR to support it in its operations of alleviating the sufferings of these IDPs." In her remark, the UNHCR’s Acting Country Representative to Nigeria, Ms Brigitte Mukango-Eno, commended 2Face for the humanitarian gesture, adding that her Agency currently needed public support for its operations in the North East. Mukango-Eno, who was represented UNHCR’s External and Donor Relations Officer, Mr Hanson Tamfu, said that the activities of Boko Haram in the North- East had overstretched the agency’s financial base. “We sincerely want to express the gratitude of the UNHCR to 2Face. This is a right step toward our private sector following. Over these years, it has become important for us, as an organisation, to depend on the private sector, for us to be able to meet our responsibilities. 2Face has scored a very important goal by discovering the UNHCR Office within the UN system. We want to use this opportunity to appeal to other private Nigerians and philanthropists to emulate this gesture by the 2Face Foundation in alleviating the conditions of the IDPs in the North East," she said.